How much does it cost to leave the workforce to care for a child? As many parents know, a typical American family spends a lot of money on childcare each year. In Pennsylvania, the cost of childcare is often higher than what a family pays in rent each month. 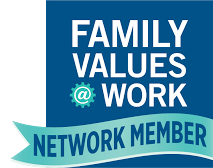 One option that some families consider is having a parent leave the workforce entirely in order to care for a child. But until now, there was little research on the financial impact of making that decision. 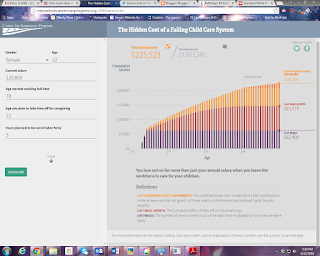 The Center for American Progress now has a calculator showing the hidden cost of leaving the workforce to provide childcare. The calculator shows the immediate loss (income not earned) as well as the loss in potential wage growth over a career and lost retirement savings. As PBS NewsHour points out, a 26 year old woman earning $50,000 who leaves the workforce for three years to care for a child loses more than $150,000 in salary - she loses over $500,000 in her lifetime in salary, wage growth, retirement benefits, and Social Security. Three organizations (ACCE, NJCU and ISAIAH) are releasing a report today about women and debt called “Pinklining: How Wall Street’s Predatory Products are Pillaging Women’s Wealth, Opportunities and Futures.” “Pinklining" refers to aggressive lending by banks and the finance industry disproportionately harming women, and particularly women of color. The report focuses in on payday, student and mortgage lending and is available here. 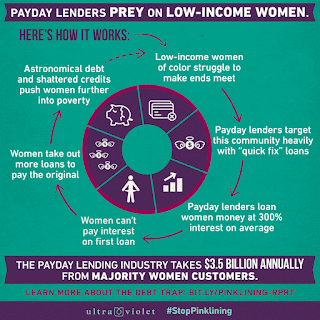 Stop the Debt Trap Caused by Payday Lending! The Consumer Financial Protection Bureau (CFPB) recently released proposed rules that, if strengthened, could rein in the worst abuses of payday and car-title lending. This is a huge opportunity to stop the debt trap, but the CFPB needs to hear from you. Want to do more to stop payday lending? Call your representative and ask them to pass a clean Financial Services and General Government Bill. You can reach your representative by calling 202.224.3121 and asking to be connected to their office. If you don't know who your Representative is, find out here. How Has Welfare Reform Affected Your State? The Uncertain Hour, from American Public Media's Marketplace, is a new documentary-podcast (docu-pod) focusing on "the uncertainties of our economy today: who deserves what and why?" This season, they're shining a light on welfare reform, 20 years after it passed and was signed into law by President Bill Clinton. You can listen to the stories here, but you can also learn more. The Uncertain Hour's website includes a deep dive into the data in welfare reform, and breaks it out by state. Below is some of the data from Pennsylvania.